The 10th anniversary season starts on the Global Map in September, and it brings significant changes to clans. The 10thseason starts in the second part of September and will last until mid-December, while a massive event will start on the Global Map after the New Year. 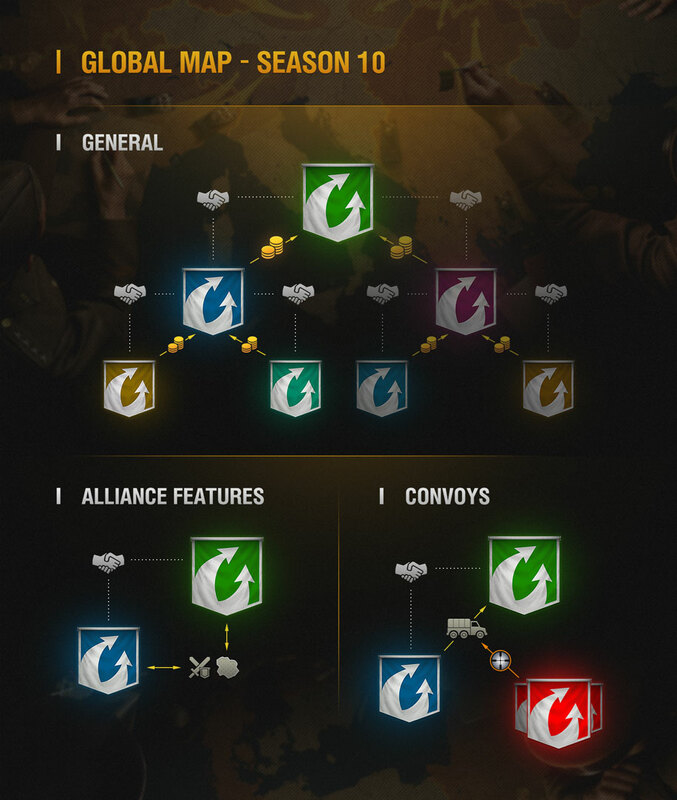 On the Global Map, clans will be able to consolidate hierarchical (feudal) units called Alliances. Any alliance has a main clan (Major Power) and subordinate clans (Minor Powers). A subordinate clan can have only one major power, while a major power can have several minor powers. Minor powers pay off some of the resources they earn on the Global Map to their major power with special mechanics. Transferring provinces from one clan to another: A clan can hand over a province it owns to its minor or major power on the Global Map, thus helping an ally to be in the right place on the map at the right time. Delegating battles: A clan can delegate its attack to a minor or major power on the Global Map. In this case, the allied clan fights in the battle instead of your clan, which allows allies to coordinate their actions and makes warfare on the Global Map more impressive. Once clans arrange their relationship, a minor power needs to pay off some of its earnings on the Global Map to its major power. However, these resources are not sent directly to the major power’s treasury, but instead are transferred via the new battle mode on the Global Map — Convoy. After a subordinate relationship is approved, a part of the resources the minor clan earns starts accumulating in a special treasury. Once a certain amount of resources has been accumulated, the minor power clan needs to send them to its major power. Other clans (not members of the alliance) can intercept this convoy and plunder some of these resources if victorious. These are the first and most important details. More information regarding the game mechanics will be revealed in the regulations of the 10th season. Keep an eye on the news! Better years late than never, derp. Wonder if they are just going to give camo or if they will allow you to buy a tank too?